There are two kinds of ‘fillers’ – putty type fillers used to fill scratches, dents, and holes in wood, and grain (aka pore) fillers that serve to level out the surface of open grained woods. It’s the latter filler that concerns us here. Woods such as oak, ash, elm, mahogany, chestnut, walnut, wenge, and teak are characterized as having ‘open grain’ because the wood pores are large. In contrast, ‘closed grain’ woods like hard maple, cherry, poplar, beech, and bubinga, have much smaller pores. You don’t have to fill the pores of any wood before applying a finish – and a lot of woodworkers don’t. It’s a matter of what you want the final surface to look (and feel) like. If you want to achieve a super smooth finish on open grained woods fairly quickly, then your best bet is to fill the pores before you apply your chosen finish. Good candidates for pore filling are large horizontal surfaces – the tops of tables, desks, sideboards, dressers, fancy boxes, and the like. A sealer coat, washcoat, or a sanding sealer won’t necessarily fill wood pores. The first coat of finish you apply to a wood surface effectively seals the wood, which is why it’s called a ‘sealer coat’. However this coat doesn’t necessarily fill up all the pores – especially on those open-grained woods I mentioned above. When you apply that first coat of finish (i.e. the sealer coat), the wood fibres will likely swell, giving the surface a fuzzy texture (known as ‘raised grain’). This is especially apparent with water-based finishes. Before you apply subsequent coats of finish you’ll want to sand off these fibres. Once you’ve sanded back the raised grain, it won’t occur again. 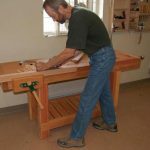 To make it easier to sand back this first coat of finish, many woodworkers will thin the finish with it’s appropriate solvent, or use a 1 pound cut of shellac. This thinned version of the finish is called a ‘washcoat’. In production shops, where they often spray on lacquer or varnish, they’ll typically use a commercial product called a ‘sanding sealer’ rather than a washcoat.